MicrOFix Locator Beacon, For The Seriously Extreme | OhGizmo! By Evan Ackerman on 06/26/07 • Leave a comment! 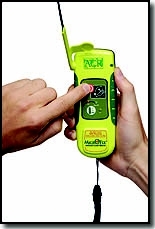 Boy, I wish my life was exciting enough that I’d have a serious need for a personal locator beacon (PLB). Like a GPS device, a PLB knows where you are, but unlike a GPS device, it doesn’t tell you… Instead, if you get into trouble, it broadcasts your location on an emergency satellite channel and (theoretically) someone will show up and help you out. The ACR MicrOFix is a relatively small and affordable PLB, at 1.4 x 5.85 x 2.21 inches, 10 ounces, and about $650. It’s mind blowingly easy to operate; just push the red button. No frills, nothing complicated, and easy to operate one handed (for situations like this, for example). A PLB is one of those things that you have no need for until you have a desperate need for, so better safe than sorry, right? For you aquatic types, I would recommend the ResQFix, which is functionally the same except that it comes accessorized with a neoprene floaty jacket. You can find both of these models for around $650 from a variety of online retailers.